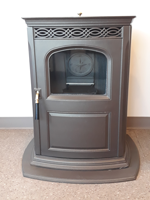 Harman Accentra Freestanding pellet stove~Showroom model only; cast iron with Honey-Glo Brown finish. 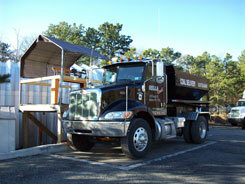 this unit has a 50 lb hopper capacity and up to 40,000 BTU output. 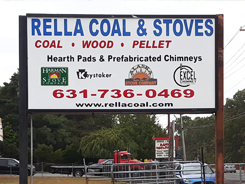 On Sale now for $3639 including cast iron hearth pad. That's a total savings of over $600!!! 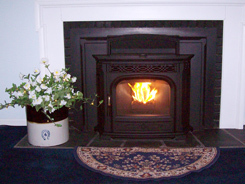 Harman Accentra 52i pellet fireplace insert. Showroom model only. Cast iron with Majolica Brown enamel finish. This unit has a 50 lb capacity hopper and up to 52,000 BTU output. On Sale now for $4399~that's a $1,000 savings!!! 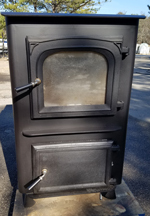 Alaska Kodiak Hand-fired manual coal stove. Showroom model only - top flue, steel frame with matte black finish. With a 35 lb. capacity gravity fed hopper and up to 100,000 BTU output, this unit is sure to keep your home warm and cozy. On sale now for only $1995!! Keystoker double wall 75; rear vent, natural draft, automatic coal stove; black steel; 70 lb. capacity hopper; up to 75,000 BTU output, 2000 sq. 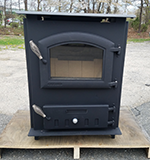 ft. heating capacity; Refurbished model; Sale price is $1300.